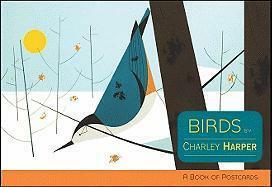 Wildlife artist Charley Harper (American, 19222007) came by his love of nature as a child growing up in rural West Virginia. After studying at the Art Academy of Cincinnati and the Art Students League in New York City, he gained acclaim as a commercial illustrator for numerous publications, most notably The Golden Book of Biology and Animal Kingdom, childrens books published in the 1960s. As demand for his work grew, he went on to have a successful business producing limited-edition silkscreen prints. Pomegranates books of postcards contain up to thirty top-quality reproductions bound together in a handy, artful collection. Easy to remove and produced on heavy card stock, these stunning postcards are a delight to the sender and receiver. Postcards are oversized and may require additional postage.